LOS ANGELES (AP) -- When Robert F. Kennedy decided to duck through the kitchen of the Ambassador Hotel in Los Angeles after declaring victory in the 1968 Democratic presidential primary, Juan Romero reveled at his good fortune. It meant the 18-year-old busboy might get to shake hands with his hero - the man he'd assured himself would be the next president of the United States - for the second time in two days. For decades, each time Romero saw black-and-white news photos of himself - a baby-faced busboy gently cradling Kennedy as he lay sprawled on the hotel's concrete kitchen floor - he would wonder what more he should have done to save Kennedy. "I will never forget the handshake and the look ... looking right at you with those piercing eyes that said, 'I'm one of you. We're good,'" Romero said. "He wasn't looking at my skin, he wasn't looking at my age ... he was looking at me as an American." Iconic as they were, they brought Romero a place in history he never wanted. 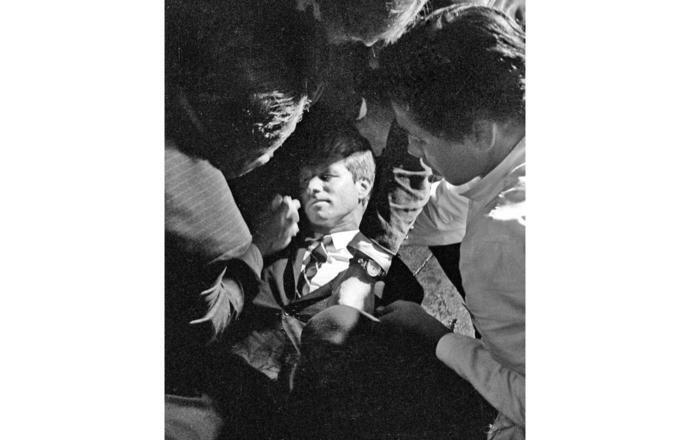 For years he blamed himself for Kennedy's death - wondering if he could have done something to prevent the shooting or if Kennedy might have survived if he had not stopped to shake his hand. Pac-12 Networks' JB Long and Wes Clements break down Cal's upset win over No. 1 UCLA Friday night from Los Angeles, CA. The Golden Bears were powered to victory by starting pitcher Jared Horn, whose 10 strikeouts over 8.1 innings of work kept UCLA bats relatively silent. The turning point came int he seventh inning, as Cal's Cameron Eden and Andrew Vaughn both homered to push Cal over the top. The loss snaps an 8-game winning streak for UCLA, who fall to third in the Pac-12 standings.